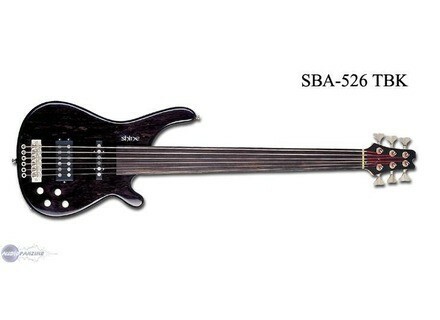 SBA-526 TBK, Electric Fretless Bass from Shine. I came across this model some 14 years ago when writing for a U.K. instrument magazine. I fell in love with the Shine range and currently have 6 Shine basses (five of them 6 stringers) out of my 8 total. I bought this model new in 2004 and it's become my number one bass, for jazz and show work. Occasionally I wondered what I would do if it ever got damaged so I recently found another one on Ebay which I got for the princely sum of £45 (the world cup was on TV at the time, so nobody was bidding)! The trade price in 2004 was £420, just for info. You can see my two basses in the pic: the original one is on the left, the latest acquisition on the right. Why am I such a fan of this make and particularly this model? Because it does the job, pure and simple. The 6 string neck (like all 6 string necks on Shines) is wide, but quite thin in section from front to back, so you find that it's very easy to navigate the full register without straining your left hand (as an aside, an Aria SB1000 that I tried in the 1980s was, for me, like trying to play a cricket bat) . Overall, it's a delight to play, well balanced and with easy access right up to the top of the range. The body shape is typical of the time and is shared on many of Shines basses. At a guess I'll suggest that it might be derived from the Ibanez design, which is hardly surprising given that Shine made OEM instruments for Ibanez, Washburn and others.With all Shine basses (even the later Chinese ones), the finish and attention to detail is exceptional for an instrument of this price. The pickup combination is excellent, with one single coil and a humbucker which gives a very warm sound compared to Shine WEB 846 6 string with its two single coils. Shine six strings all have active 2 band EQ (there are also some with 3 band EQ). A lot of fellow musicians and punters have complemented me on my sound as a result, describing it as full, rich and warm. That's my sound! My recent acquisition basically came 'as is' from the factory. The previous owner told me that he bought it from a music shop that was closing down, so nothing has been done with it. Various problems can occur if the instrument hasn't been set up properly. Firstly, the top nut (in this case brass) is way too high, being set up for a fretted instrument. This is a common fault with fretless basses from manufacturers, and I've seen it on Ibanez's own basses in the past. The nut needs to be lowered almost (but not quite) to the fingerboard itself, and the neck needs to b emore or less straight - virtually no relief as there are no frets on the board. The action overall can be lowered quite a lot to get the much preferred 'mwah' factor, and this will make the bass incredibly easy to play. The factory strings are roundwounds - not bad in themselves, but there are better options. Personally, I always use flatwound strings on my fretless bassses; they don't carve up the fingerboard as much as roundwounds, you don't suffer from string squeal when moving up and down the neck, and for those who want a more double bass-y like sound, they're ideal. I've used Rotosound Jazz strings in the past, which are very good, but my preference now is for Thomastik Jazz flats (JF346) which are nice low tension strings with an incredible tonal response and makes this bass so easy to play. Try these ideas out and I think you'll be delighted with the results. In conclusion, this is a terrific fretless bass, and s/h prices are amongst the best anywhere. Shine seem to have dropped off the radar (at least in the U.K.) so look at the s/h market for suitable candidates. Do you really need a 'name' brand with exotic woods and all the bells and whistles for up to 10X and more what you'ld get a Shine bass for? Is the expensive one 10X better? I think not. If you're not worried about the name on the headstock, but just want a terrific instrument that's eminently affordable, Shine have a lot to offer (usual disclaimer). 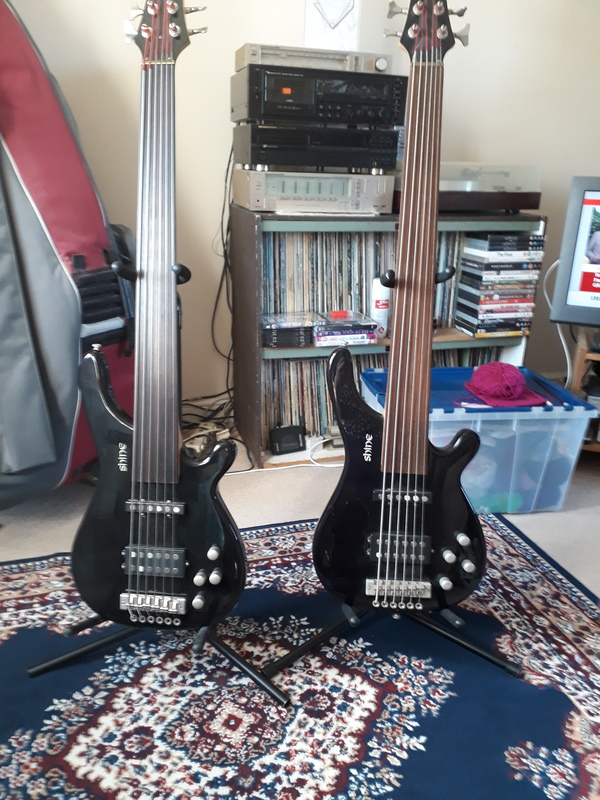 I love both of my Shine six string fretless basses.